Our Pool Services Will Renovate Your Inground Pool … You’ll Renovate Your Lifestyle! When Leisure Craft Pools was founded in 1972, the Kohlhas family had one goal in mind. We wanted to take existing gunite pools and turn them into objects of renewed beauty and luxury. 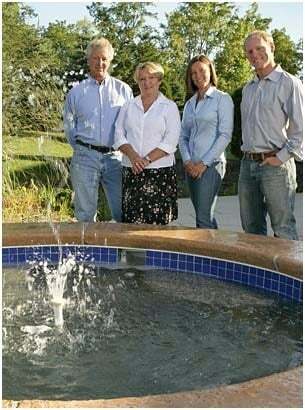 Over the years, Leisure Craft Pools truly became a family business. Jeff Kohlhas serves as COO, supervising and coordinating crews in the field. Laura Cravotta, VP, handles residential sales. Together we have brought new vitality and ideas to our Lancaster-based business, including making pools more energy efficient and easier to maintain, like installing computer controls that can be operated from a cell phone. Pools start out as a fun, even glamorous, amenity, but over time they start to show their age. Problems like cracked concrete, broken tile, inefficient electricals, rust-stained walls, leaks, and broken, cracked decks not only take away from the beauty of a pool, they can become dangerous. That’s when it’s time to bring in the experts from Leisure Craft Pools for renovations and repairs. Our team of professionals can update it all, along with opening, closing and maintaining residential and commercial in-ground pools. We invite you to look over our website. See for yourself how beautiful your pool and surrounding area can look when repairs and upgrades are made using our high-quality materials. You might even come away with ideas for a pebble deck, spa or waterfall. We’re here to offer you the expertise of our established and ever-evolving company. More importantly, as a local, family-owned business, we see you not just as clients but also as neighbors. If you look good, so do we! Schedule a consultation today, and you’ll be enjoying your “better-than-new” pool in no time! Is your pool no longer looking its best? With more than 40 years of experience renovating and repairing pools, the team at Leisure Craft Pools is ready to lend our expertise. From start to finish, we will handle the entire process, leaving you stress and hassle-free. We’ll plan ahead to ensure minimal pool downtime. Then highly trained pool technicians will install the finest quality materials while keeping the job site safe and clean. Not only will your pool get a boost, so will your property value!